Ricky Jones was a native of Dahlonega, Georgia. He graduated from North Georgia College where he played varsity baseball. Rick also served as a city councilman and mayor of Dahlonega. After receiving his commission from North Georgia College, Rick attended IOBC, Airborne School, and Ranger School. 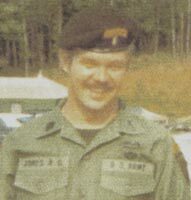 Rick served with the 82nd Airborne Division at Fort Bragg, North Carolina. Rick served in Vietnam with the 101st Airborne Division. His awards and decorations include the Silver Star, Bronze Star w/V Device and two oak leaf clusters, Purple Heart, Air Medal, Army Commendation Medal, National Defense Medal, Vietnam Service Medal, Republic of Vietnam Campaign Medal, Ranger Tab, Airborne Wings, and Combat Infantryman's Badge. Rick was tragically killed in an automobile accident in 1993. Rick is survived by his wife, four children, and two brothers.